Our last update left you at Cartagena in Colombia, the magnificent jewel city of the Caribbean. We left there in mid-Dec for the San Blas Islands, a remarkable group of around 400 small islets on a reef strewn, shallow shelf just off the north side of the Isthmus of Panama. They are inhabited by the Kuna Indians, originally a warlike race who fought for and gained a high degree of independence within the Panamanian State that has enabled them to retain much of their traditional life-style and culture. They live to an exacting, sociopolitical code in compact, tidy villages of bamboo huts, often supported on stilts overhanging the waterside. This first image, below of a classic palm clad islet epitomises the outer reefs of the San Blas where amidst the idyllic beauty lie examples of the folly of man. The waters hereabouts are shallow and treacherous, hence the wreck of the yacht to the left of the islet and the majestic looking freighter behind which is high and dry on a reef, destined never to move again. The Kuna people are a very inquisitive and friendly lot, but not destined to rise to stardom as volleyball players, as they are reputed to be the second shortest race in the world after the Pygmies. Their lives are tightly controlled in communities with precise rules of behaviour and a code of responsibilities for shared duties. When arriving at a village we were expected to visit the Sahila (chief) to seek permission to land or walk the island, pay dues of around $5US and generally chew the cud in a mixture of halting Kuna and Spanish. We usually have a stock of goodies for the children of isolated communities, so it was no surprise that we attracted a following, some of whom came to see us off in the dinghy. Their homes are exceedingly basic with at most a hammock each for adults and virtually no furniture on the earthen floors. There are probably only a handful of cameras in the whole of Kuna Yala (the nation of around 60,000 souls) so visitors with digital cameras and colour printers aboard are much prized contacts. This couple dearly wished to have their first photograph together and cherished the prints we took back next day whilst others came back again for further pictures in another dress or hat. In the main, Kunas derive their living from fishing but the womenfolk have developed the art of molas, multiple layer, applique tapestries sewn with minute stitches that take tens to hundreds of hours to complete. The designs vary enormously from geometric patterns to traditional wildlife or even religious scenes. This gives rise to the verb 'to be molared', whereby a cruising boat has ten dugout canoes with molar touting Kunas hanging off it before the anchor hits the bottom. We have numbers of them which we intend mounting on cushions and maybe mounting in frames when we have somewhere with wall space enough to hang them. Their culture is rich and survives against all the odds in a country that has been heavily influenced by the US since the Canal was built nearly a hundred years ago. We found a cultural centre for Kunas living in Panama City, the local big smoke, where they gathered at weekends to keep their traditions alive amongst the skyscrapers and megastores. Our stay in the San Blas was an unusually long five weeks encompassing Christmas and New Year. This last New Year's Eve will take a lot of beating. First we celebrated the UK midnight toasting absent family and friends to the background of Big Ben on the Beeb Overseas Service, before joining an international group of around sixty cruisers for the local celebration held on an island that yachties have adopted as a social gathering place. There was an outstandingly vivid full moon that night so the memories of being with so many friends under the palms, with the stark shadows of the leaves on the white sand around us will be etched forever in our ever growing pile of treasured experiences. This is typical of all the islands, never more than a metre or so above sea level, covered in a monoculture of cocoa nut palms, fringed by white sand and turquoise seas. We stayed on around twenty of them relishing in the snorkeling and diving. Again the compressor adorned the aft deck for the whole stay and Dave was lucky enough to find some of his best diving ever. Not quite in the same league for clarity and marine life as Los Roques in Venezuela but still world class. One dive in particular on an undercut reef off the island of Madununudup has been rated by experienced circumnavigators as one of the world's top ten dives. Crabs like this abound in San Blas and make better eating than the lobsters! This period was a magic time to reflect on our two years in the Caribbean before we moved on. As fish, crab and lobster were easily come by, foraging the reefs or bartering with local fishermen, much of this musing was over seafood dinners in the cockpit with a tropical sunset backcloth. These magnificent crabs with huge claws were plentiful and much tastier than the more prized lobster. We really were grateful for the huge stainless pressure cooker we bought in Gibraltar with exactly this job in mind. Sometimes forward planning pays off bigtime! 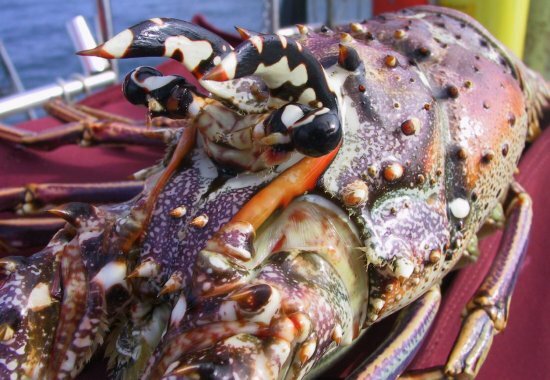 Speaking of lobsters, here's a close up of the Caribbean specie. Without the large claws of their European brothers they are more like what we knew as crayfish. You will note they are well protected by a plethora of sharp spikes so thick diving gloves and a tight grip are essential especially for larger ones, like this one Dave caught in the East Holandes Cays. Cruising is all about making new friends and meeting up with old ones to share experiences. The Festive Season in the islands was a great time to do just that. Here is Di, tinny in hand with two friends at one of the many beach BBQs we shared. Maggie from Dream Time, on the left was originally from New Zealand but spent most time recently in Chicago. Mary from Meriva, on the right is from the Midlands and with husband Mike has shared much of the trip down from Venezuela with us. We discovered this modest looking island below, on our way into the charming bay at Portabello on passage from the San Blas to Colon. As we sailed by we struggled to honour the ancient British seafaring hero by reciting the poem, Drake's Drum. However, the words came reluctantly to mind so we settled for lining the deck (all two of us) and blowing long, modulated salutes on the horn. By this time in late January the enhanced Trade Winds had set in so offshore sailing was 'robust'. We entered the breakwater at Colon with some relief and a feeling that a challenging and very rewarding part of our voyage was at an end and new experiences around the corner, or more precisely, through the ditch. Colon at the northern entrance of the Panama Canal is aptly named (that anatomical part of the Caribbean!). It has a rundown cowboy like appearance, almost a hangover from the building of the Canal a hundred years ago. It is also wild and dangerous with many parts of the town that even the police wouldn't enter. Cruisers were mugged on an almost daily basis, some friends loosing $400 when a thief grabbed their wallet in a bakery and did a runner into an alley. No time to worry about such things though as it's the place to start stocking up for the long Pacific voyaging ahead. There is also the Canal transit to arrange which involves an inspection and over detailed measurement of the vessel by an Admeasurer. This is primarily to ascertain that we are equipped and fit enough to endure the trip through at speed . Its also to see whether he could stretch our 44ft plus boat length to over 50ft, so increasing the transit charges from $500 to $750. Of course he failed. We were additionally fortunate as we transited on the 5th Feb as a fortnight later it was announced that as from 1st March, any vessel that could not guarantee to make 8kts continuously would have to pay a further $420. Still, a small price to pay when Cape Horn is the only alternative! Our transit was such a long, adrenaline filled day of amazing stimuli that it is difficult to know where to begin. In addition to a skipper, we must have four line handlers and a Canal Advisor who is a trainee pilot. Ours was called Jimmy Wong who came originally from Singapore, a great guy and good at the job too. Dave discovered Jimmy when he did a trial transit on a Dutch boat a week earlier and asked for him when we confirmed the passage. Our line handlers were Al from Toronto on Solara, Marco from Italy on Bora and Dan a guest from Meriva. We went up the first three Gatun locks (305m long, 33.5m wide and 26m deep) rafted to our friends Malc and Lyndie on Mr Bean, each boat handling two lines to keep the raft in the centre of the lock as around 179M ltrs (39M gallons) of water surged in below us. At the top of this flight of three locks we began a high speed dash across 25 miles of Gatun Lake to keep ahead of the big container vessel we were sharing the lock with. Suddenly it appeared we might have to anchor out of the way and overnight there, as a US nuclear submarine was coming through the other way and there were special security measures after the suicide bomb attack on the destroyer in Yemen. Fortunately, Jimmy argued our case successfully and we were allowed to proceed. The security was indeed tight with a Black Hawk helicopter circling overhead and lots of armed patrol ships with guns manned around the sub. In the picture of it you can just see Titan, one of the huge cranes that are kept ready as canal equivalents of a tow truck in case vessel sinks in the channel. As a piece of engineering the Canal, even after a hundred years, is still outstandingly impressive. The difficulty of cutting through the continental divide at Gaillard and Culebra here required the removal of over 100 million cubic yards of material. All this was achieved in one of the most inhospitable and unhealthy tropical climates anywhere in the world. There is a remarkable account of the political, medical and engineering background to this endeavour in David McCullough's excellent book 'The Path Between the Seas' (Simon & Schuster, ISBN 0-671-22563-4, 0-671-24409-4 Pbk). Just how much room is there down the side of this Panamax vessel? This picture illustrates just how tightly ships are built to fit these locks. It is creeping up behind us in the final lock down at Miraflores, controlled by eight of these powerful electric trains called Mules, two at each 'corner'. It ended up towering above us around 20m from our stern. Quite a relief when it stops moving as we have the lock gate just ahead of us. We began our transit at 6am and emerged into the Pacific at around 3.30pm, passing under the Bridge of the Americas and on to anchor in a pleasant bay by Isla Flamenco. Here we stayed to make final preparations and cram aboard those last few supplies for the months ahead in the remote areas of the South Pacific. However, it wasn't all maintenance, repair and shopping. Our stay coincided with carnival so with a group of friends we toured the route, sampling local foods and of course drinks whilst generally soaking up the atmosphere and indulging in the traditional water pistol fights. Carnival in Panama City is brash, noisy and colourful. Atlas is the local brew! Our next leg is a short one to the beautiful Islas Perlas about 40 miles offshore. There we'll clean off the bottom ahead of the first long sail of around 1000 miles to Ecuador or Galapagos. We probably won't decide which until we see what conditions we have en route. It's the area close to the Equator known as the Inter Tropical Convergence Zone (ITCZ) where winds tend to be light and variable. The other factor is El Nino which is definitely building this year and may cause problems in the eastern Pacific within the next 2-3 months. We may need to get the 3000 mile passage from Galapagos to the Marquesas in French Polynesia over sooner than later. After that, all those magical island names including Tahiti, Bora Bora, the Cook Islands and Tonga where in about October we will leave to make the difficult 1000nm passage to New Zealand.